Over two million American servicemen passed through Britain during the Second World War. In 1944, at the height of activity, up to half a million were based there with the United States Army Air Forces (USAAF). Their job was to man and maintain the vast fleets of aircraft needed to attack German cities and industry. Working with the Royal Air Force (RAF), their aim was to severely weaken Germany's ability to fight. This was a central part of the Allied strategy for winning the war. American women also served, working for the American Red Cross or as members of the Women's Army Corps. Over 200 airfields were occupied or newly-built by the USAAF. Each one would house around 2,500 American men – many times the population of the nearest village. Thousands more were based at smaller sites. Halls and country houses became headquarters for commanders and planners. Some were converted to hospitals or rest-homes for combat-weary fliers. Barns and outbuildings would house teams of truck drivers and their vehicles. Even specialist bakery units were dotted around the UK, providing fresh bread for the airmen. No wonder, then, that the Americans' arrival was known as the 'friendly invasion' – their impact on British life was huge and they profoundly changed the places they inhabited. The majority of the Americans left Britain in 1945. They left an enduring legacy and are fondly remembered by those they met. Hundreds of volunteers across East Anglia still help preserve these memories. They look after memorials in village squares, on corners of former airfields, or at crash sites. They manage museums in former control towers, or preserve precious collections in pubs or farm buildings. They run websites and contribute to our growing interactive archive, helping present and future generations understand the enormous impact that these servicemen had. One man did more than most to safeguard this legacy: Roger Freeman, the boy from Essex who was so fascinated by the base near where he grew up that it turned into a lifetime of research, writing and sharing. 'They were to leave a considerable impression on those who knew them, which did not easily fade when they departed', he wrote. Roger amassed thousands of photographs of this momentous period, which IWM acquired for the nation in 2012. The following is a selection of photographs from his collection. They also feature, alongside many others, in IWM's new book Somewhere in England, which has been published to coincide with the reopening of IWM Duxford's American Air Museum. The vast majority of the 15,000 photographs in the Roger Freeman Collection are also available on IWM's American Air Museum website. 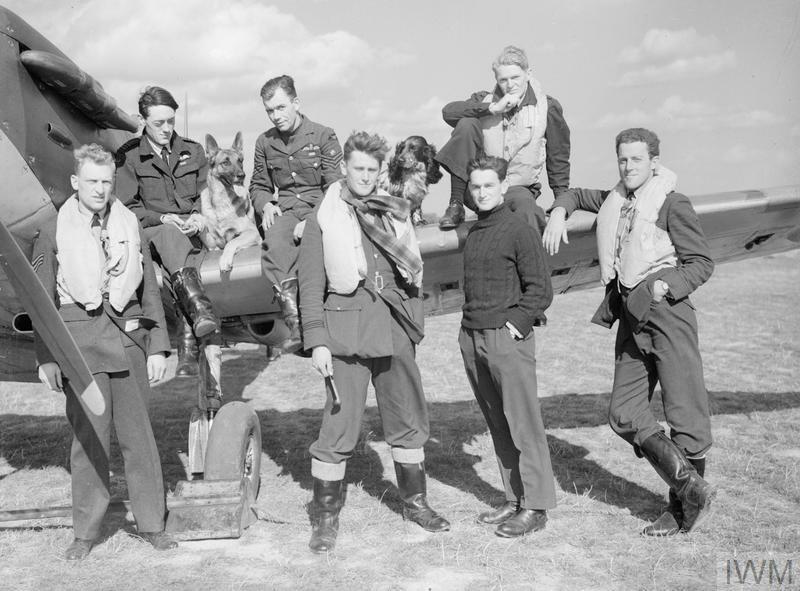 If you know something more about the people, aircraft and places depicted, or if you would like to try your hand at a bit of historical detective work, we would love for you to add your stories. 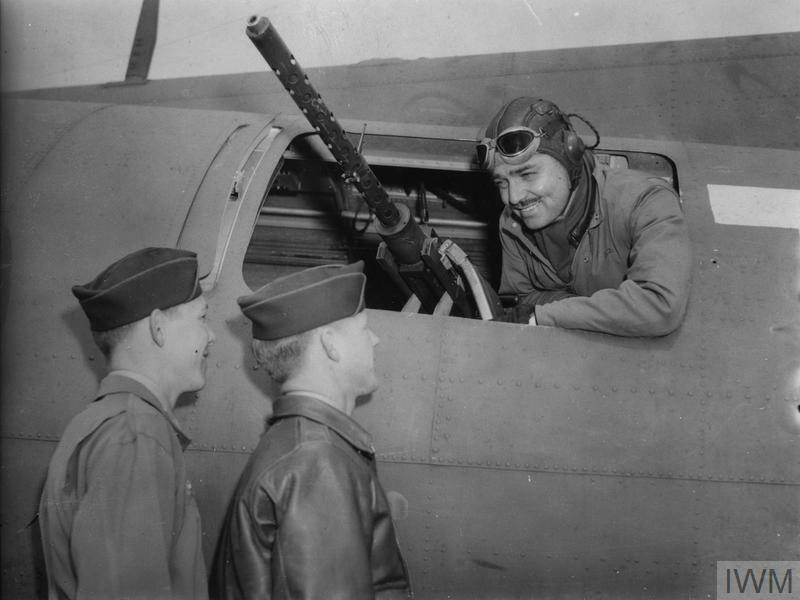 Captain Clark Gable speaks to Sergeant Phil Hulse and Sergeant Kenneth Huls, both of the 351st Bomb Group, from the waist gun position of a B-17 Flying Fortress. Gable, star of Gone With the Wind, traded Hollywood glamour for military service in 1942. Dispatched to Polebrook, Northamptonshire with a film crew of five in April 1943, Gable produced and directed Combat America, which focused on the experience of aerial gunners. He flew on five missions in order to make the film before returning to the US to edit it. The film was completed in 1944 and both Hulse and Huls were featured in it. 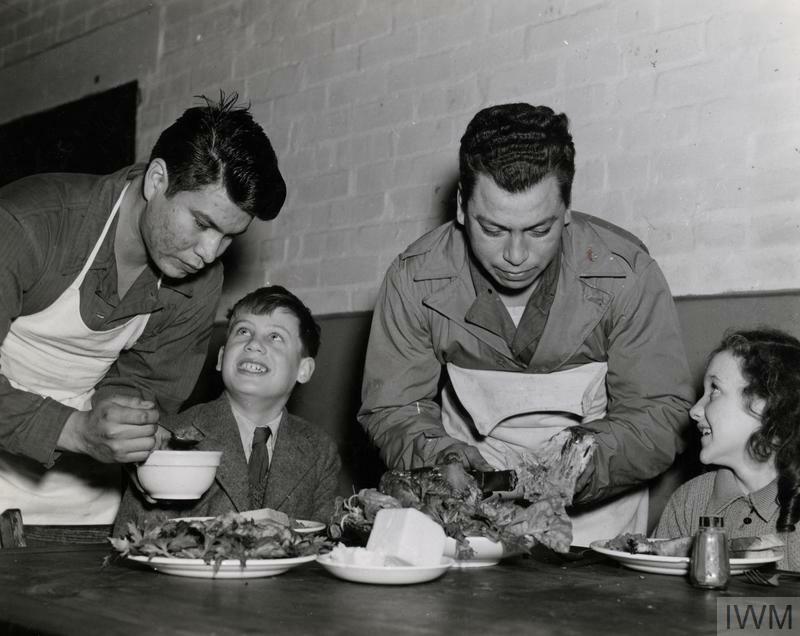 Corporal Joseph Sleeping Bear (left) serves Thanksgiving dinner to school children at Snetterton Heath, Norfolk in November 1944. Sleeping Bear was part of the Sioux tribe and grew up in Running Bird township, a reservation in South Dakota. No section of American society that participated in the Second World War made a greater per capita contribution than the Native Americans. An estimated 44,000 in a population of 350,000 signed up to the military. 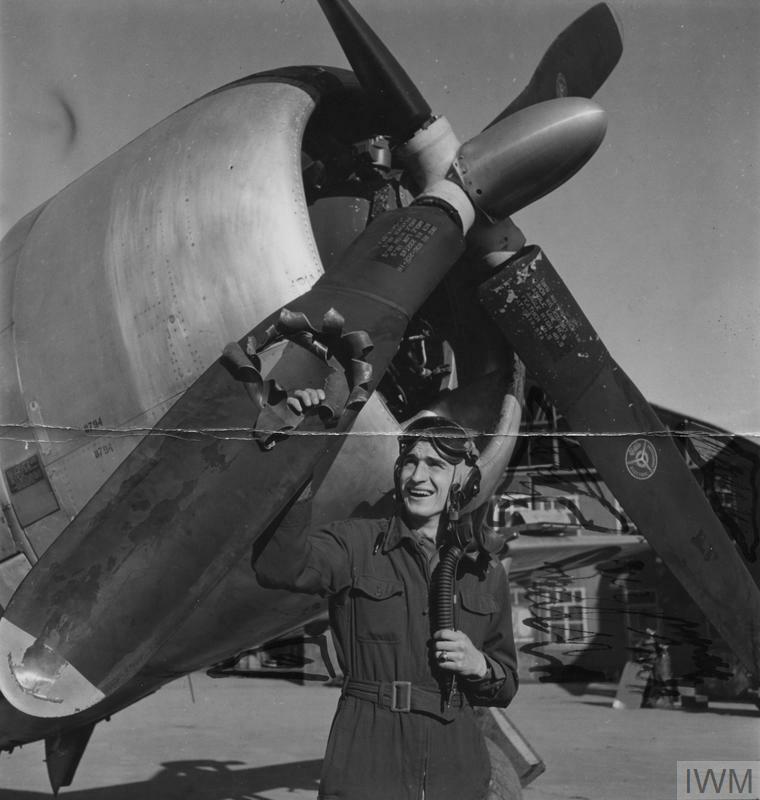 Lieutenant Edwin Wright of the 404th Fighter Group shows off the damage to his P-47 Thunderbolt, October 1944. 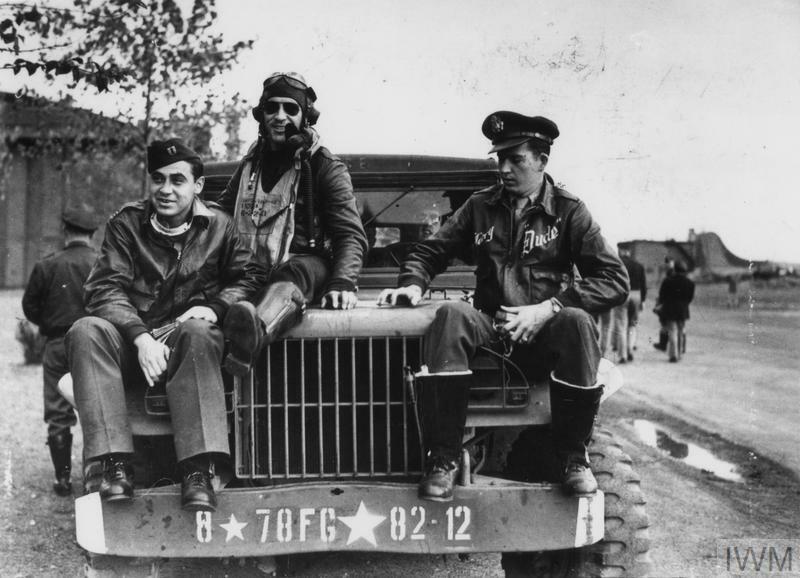 Wright was part of the Ninth Air Force, which moved its bases from Britain to mainland Europe after D-Day in order to provide closer support to the advancing troops. This picture was taken near St Trond, Belgium. By the time this photograph was taken, the 19-year-old had completed 39 missions and survived being hit by flak six times. Wright's squadron nicknamed him 'Lucky' for his ability to evade death. The hole here measured 8 inches (20 cm) in diameter in an 11-inch propeller. If the damage had been an inch and a half over on either side, the blade would have severed and Wright would have been brought down. Staff Sergeant Jayson Smart of the 305th Bomb Group immediately after a mission in August 1943. 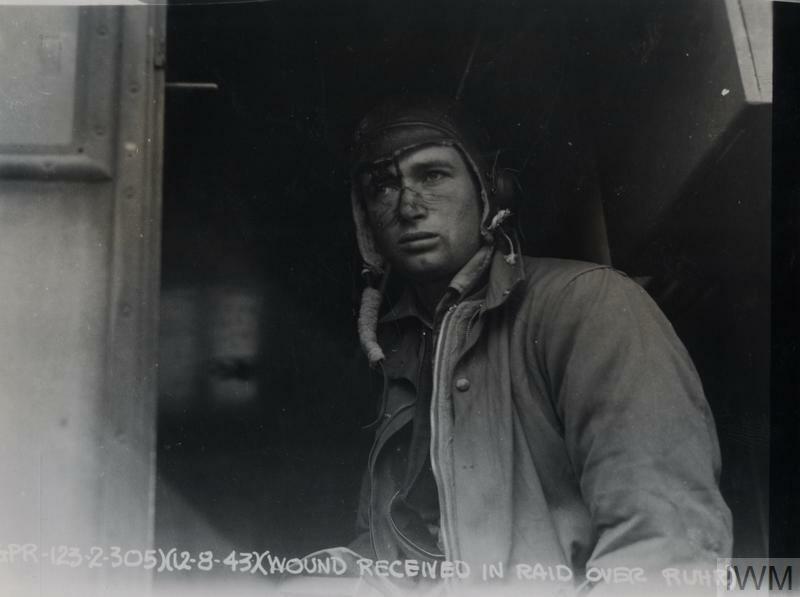 A splinter cut his brow during the mission and blood has streaked his face in the shape of his oxygen mask. The day this photograph was taken, Smart had flown as a waist gunner on the B-17 'Big Bust' on a mission to the Ruhr Valley in Germany. It was the first daylight operation to the Ruhr, which had acquired the grimly humorous moniker 'Happy Valley' due to the scale of German defences which protected its heavy industry. The bombers flew unescorted by fighter aircraft and were badly scattered en route. Enemy fighter opposition and flak damaged 15 of the 20 bombers from the 305th Bomb Group. Ten other men from the group were wounded and a further ten were missing in action. 83 men from the whole formation were killed in action. 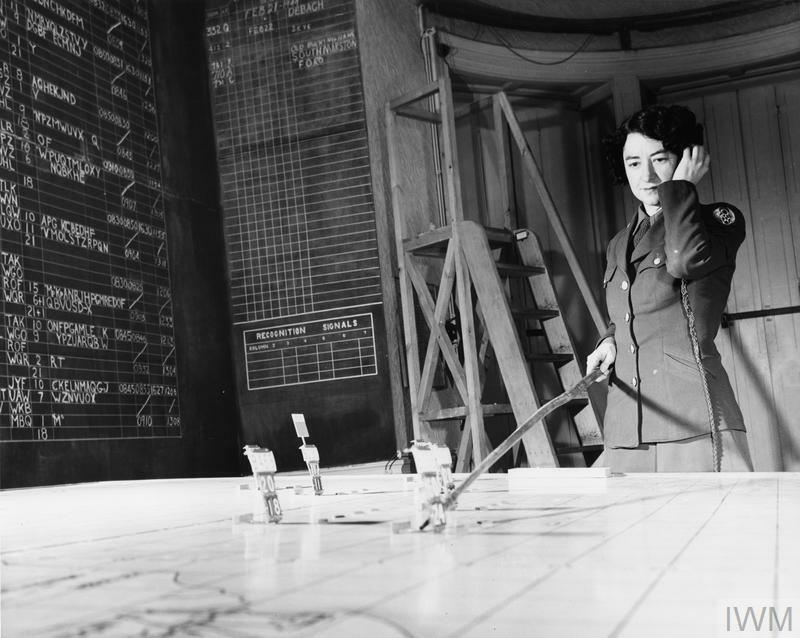 Corporal Geraldine Hill of the Women's Army Corps receives reports on aircraft positions in the plotting room of the 3rd Bomb Division at Elveden Hall, Suffolk in February 1944. Hill lived in Texas all of her life and worked for more than 30 years as a bookkeeper for the Baptist General Convention of Texas. The war brought an interruption to her career when she volunteered as part of Dallas's civil defence and then when she enlisted in the Woman's Army Corps. Hill served overseas for 27 months both in England and continental Europe. Private First Class Barbara O'Brien applies the finishing touches to a skull on the nose of a B-26 Marauder, 1943. O'Brien enlisted in Dallas, Texas, USA in December 1942. She was later part of a Women's Army Corps unit based at Marks Hall, Essex, which had taken over from the British WAAF (Women's Auxiliary Air Force) the duties of plotting, typing and stenography. 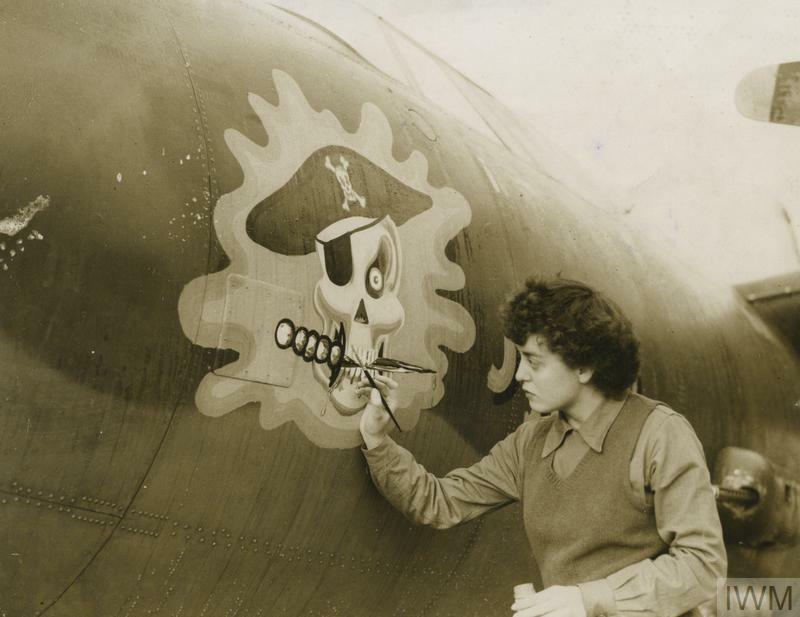 As a talented artist, she was in demand with the flyboys to add nose art to their aircraft. The aircraft she is painting here, the 'Jolly Roger' (41-34942), belonged to the 323rd Bomb Group, based at nearby Earls Colne in Essex. O'Brien continued to work as a plotter and moved with her unit to France, and then to Bad Kissingen in Germany. Film footage of O'Brien painting the 'Jolly Roger' can be found on British Pathé's website (around the 4-minute mark). 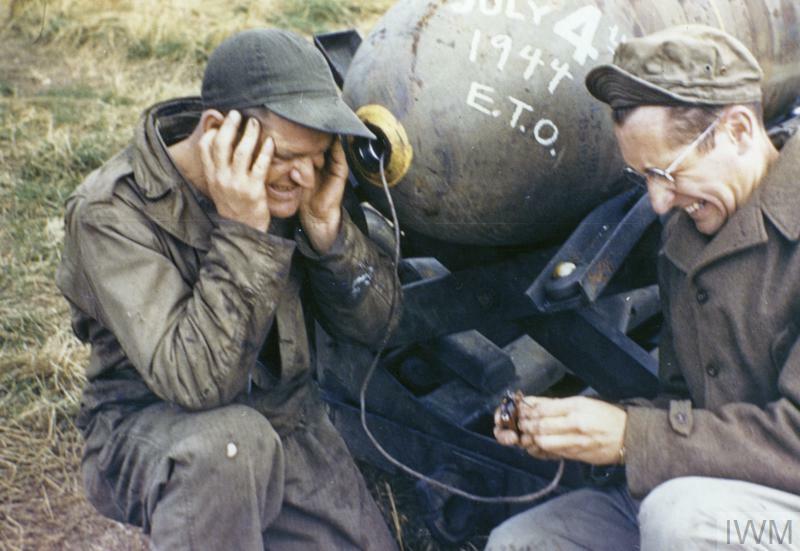 Sergeant Russell Butts (left) and Sergeant Robert Sand, ground crew of the 55th Fighter Group, pretend to light the fuse on a 500-pound bomb in July 1944. Robert Sand was responsible for the maintenance and repair of fighter aircraft. As a specialist in propeller mechanics, Sand performed a crucial role in ensuring that the engine was running correctly and felt personally accountable for the safe return of the aircraft he worked on, saying he 'could not rest easy until every ship was off safely, and had returned safely. And when any ship was lost unaccountably, there remained a little nagging question'. Ground personnel sought distractions while waiting for their aircraft to come back. Armed with his camera, Sand made a photographic record of the sights and antics on base. This photograph was taken on Independence Day, 4 July 1944. 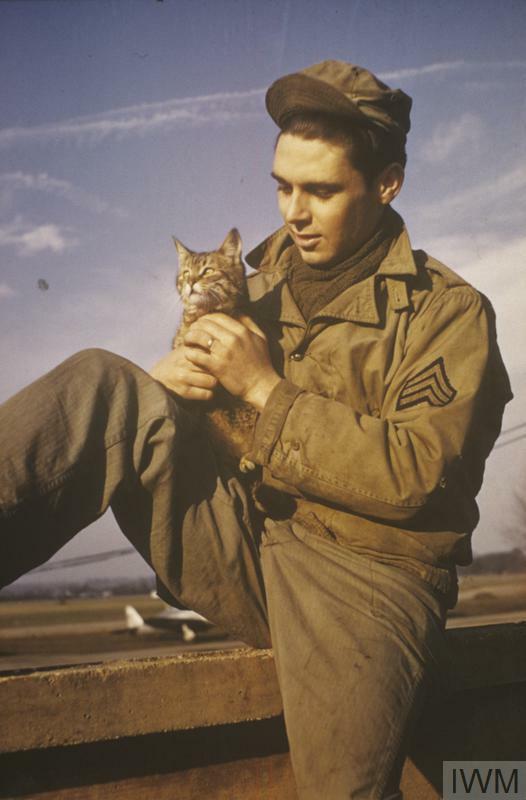 Sergeant William 'Bill' Pulliam of the 91st Bomb Group holds his cat, Cross-Eyes. Pulliam enlisted in 1942 and joined the 91st Bomb Group, where he worked as photographer for the 401st Bomb Squadron at Bassingbourn, Cambridgeshire. He was responsible for loading strike cameras into B-17 Flying Fortresses, which would photograph bombs falling on their targets. The images would later be analysed by intelligence officers to judge the success of the mission. If an aircraft from Pulliam's unit landed at the wrong base, it was his job to retrieve the film. On Christmas Eve 1944, bad weather prevented several Fortresses from returning to base and Pulliam was sent 70 miles with his colleague Sergeant Joseph Harlick. Driving at midnight with blacked out headlights, Pulliam and Harlick collided with an unexploded bomb that had been dropped from an ammunition truck. Fortunately the bomb failed to detonate and Pulliam returned home to Missouri at the end of the war, where he married his sweetheart Reyina in June 1945. Pictured from left to right are: Best man Gene Hammerick, the groom and bride Robert and May Kirschner, bridesmaid Alice Fuller and May's parents Harold and Rose Lockwood. 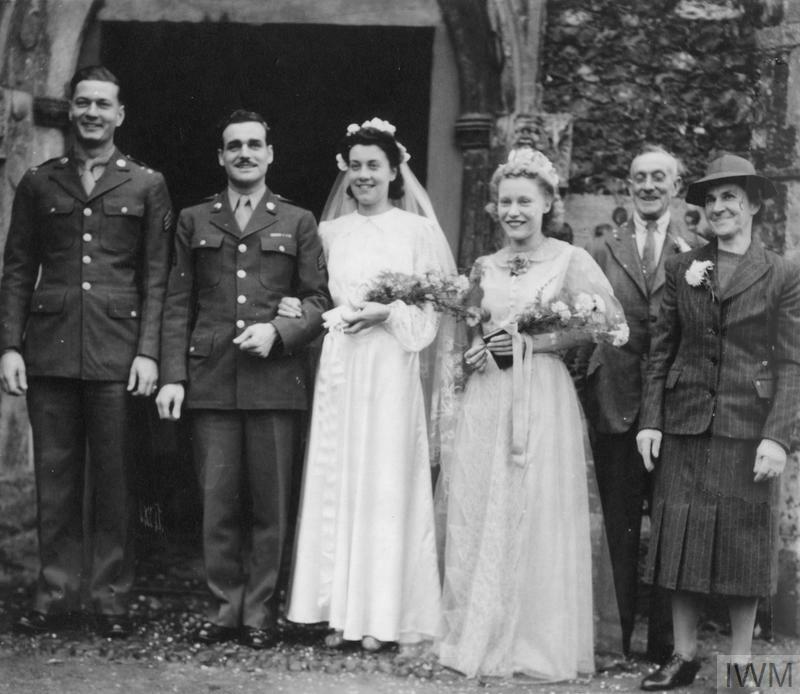 They are photographed at St Mary's Church in Coddenham, Suffolk, on Robert and May's wedding day in November 1943. 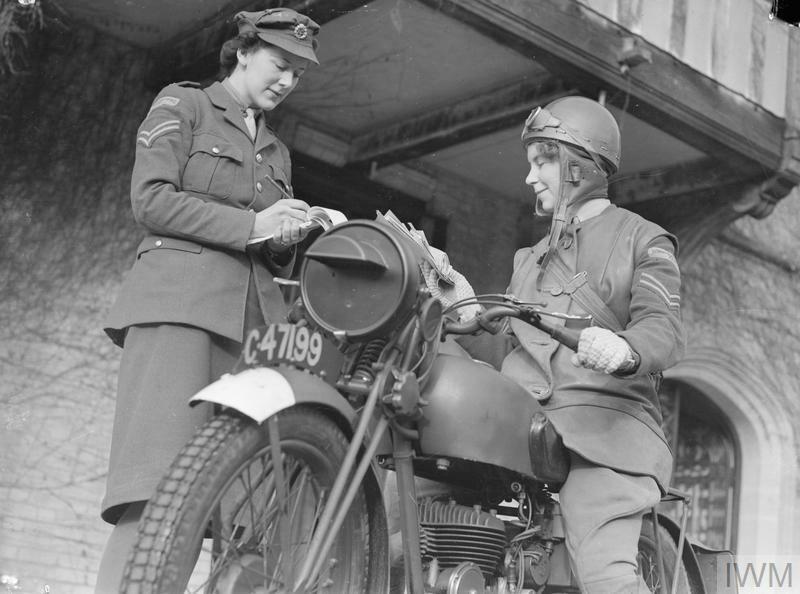 May Rose Lockwood had joined the Women's Land Army in 1940. She met Robert Kirschner, who was working in a service squadron with the nearby 56th Fighter Group, and they married in 1943. Shortly after the war ended, she was one of many thousands of young women who left their families and friends behind to begin a new life in America. With her baby daughter and husband, she settled in Syracuse, New York, and worked as a nanny. The couple were married for 51 years.